Is Vuze Right For Me? 1. RSS feed, automatically downloads all torrents in the feed. 5a) Use the 'archiving' feature to archive downloads when complete - http://wiki.vuze.com/w/Archiving_Downloads#Other (see the tag constraint). Thanks heaps, I'm trying this now will report back. Also I noticed that when putting in a torrent manually (by opening the torrent file) and then right clicking it in Vuze, then going to assign it to a tag, the list of tags only shows one of the tags I created (the RSS feed tag) it doesn't show the other tags I have set up. However if I go add tag, then type in the tag name again, it assigns it to the correct tag with the correct settings (already set up previously when I created that tag). Is there a way to get the assign to tag list to show all tags? I skipped the archiving part as I don't think I need to do that part (as far as I can tell haha). [Image: wKImiV0.jpg]From what I understand, having the share ratio at 0 means that it should instantly delete when completed correct? I'll play with this later when I know its doing what I want it to? However yeah the file completed, and then nothing happened, the tags worked it moved the completed files to the correct folder, but the delete of the torrent in Vuze didnt. The archiving thing is good in that you can easily 'restore' the download later if you decide you want to re-seed it. When it is archived it doesn't touch the actual data files, rather it just moves it from being active in your library to a separate 'archived' section where it uses very little resource. Ok, will test it around a bit to see if I can get it working. Any idea on why my other tags are not showing up in the "assign to tag" right mouse click list? I can do it by typing in a new tag every time, but my wife probably wont want to do that haha. EDIT 2: Ok, it just worked lol. But only after some checking thing happened on the download, this checking took about 5 minutes, and well it screwed up the third party application as Vuze still had a lock on the files (cause it wasn't removed from library). Is there a way to turn this checking off? 1. Tags, my list of created tags don't appear in the right click>assign tag list, I have to "add tag" and manually type it in each time, when I do this, it goes to the correct tag (already created with rules) on the left side panel. 2. Tag folder settings, I have a "initial save location" set, "move on complete" is blank, and "copy on complete" has a location. However, when a torrent starts and I assign to that tag (or auto assigns via feed) it doesn't save in that tags "initial save location", instead it saved in the Options>Files.Default Directory location. When the torrent finishes, it copys to the correct location (which is great), however it also moves to Options>Files>Completion Moving>Move Completed Files location as well which is not desired. I have set up these two options locations cause I wanted the general random untagged torrents to go into a "incomplete" folder and then moved to a "completed" folder when done. 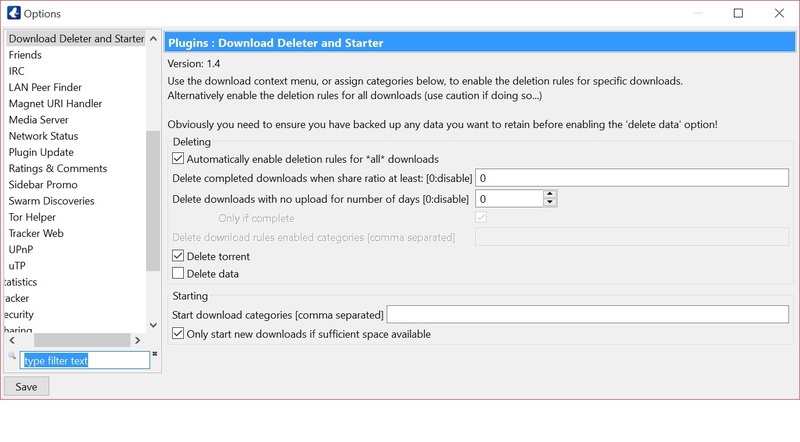 But I want the tagged torrents to have their own rules based on the tag settings. 3. I have the automatic deleter working now, and my seed ratios all set up and good. It removed the torrent from the library etc and it deletes the data. However cause it also moves to the general completed folder, it leaves the torrent there. None of these are major except for the right click assign tag thing, at present it is doing what I want it to do, I just have to go manually delete the data out of the general default directory every now and again. The right click assign tag thing is super annoying though, anyone have ideas on that? There is no list of tags, I can click "add tag" and then manually type in the tag name, it will then be assigned to the correct tag, but I have to type it in each time. However the RSS feed auto assigns the correct tag automatically, so this is only a concern for torrents I add manually myself. 2. Ah ok, that makes sense. Is there anyway to get that "torrent-addition" window back, I think I ticked the box to not show me anymore. 3. Ok, so in options turn off the auto move, and then just use a "untagged" tag for any random torrents that don't have an actual home. If you join the beta program (http://wiki.vuze.com/w/Beta_Program - the beta software is generally stable so it is pretty safe to do this) then you'll find B09 is available with the fix. Maybe it is something weird to do with the tag names you've set up - perhaps you could email me the list? Also a debug.zip from the Help menu's last option might help. Thanks again for all your help, I'm certainly liking Vuze thus far. One quick question though, once i have it set up, what does the "Start in low resource usage mode" do exactly? * Most of the UI components aren't initialised so the memory and CPU required to run the UI isn't required. Note that once you kick Vuze out of 'low resource mode' (e.g. you add a torrent to Vuze; maximize it from the tray) you can't get it back into that mode without restarting it. It was really created to help support the 'run at login' mode whereby you want Vuze up and running when logging in (to seed things etc) but you want it in the background until you really want to do something with it. Maybe its something to do with Windows 10? Also sent you an email. Hmm, that also sounds like the Tag is 'auto-asign' - please see my email reply!